My continuing mission is to seek out new life and new civilizations um, I mean spin one color of 3 Feet of Sheep each day. 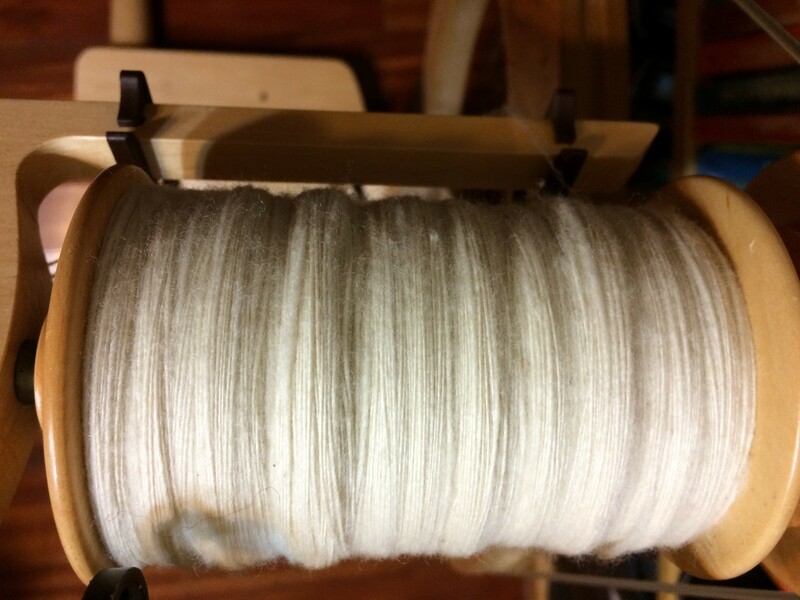 Today I spun through my one color and about 40% of the next color. Unfortunately, my Tour de Fleece will be cut even shorter than I expected. Chris’s uncle passed away early this morning and we will be going to the funeral. This means I now have at least three more days with no spinning. I do hope to finish 3 Feet of Sheep by the end of the month, even though it will be outside the usual Tour de Fleece time frame. As usual, the picture on the left is my bobbin at the beginning of the day and the picture on the right is my bobbin at the end of the day. I’m happy with the progress I’ve made so far. 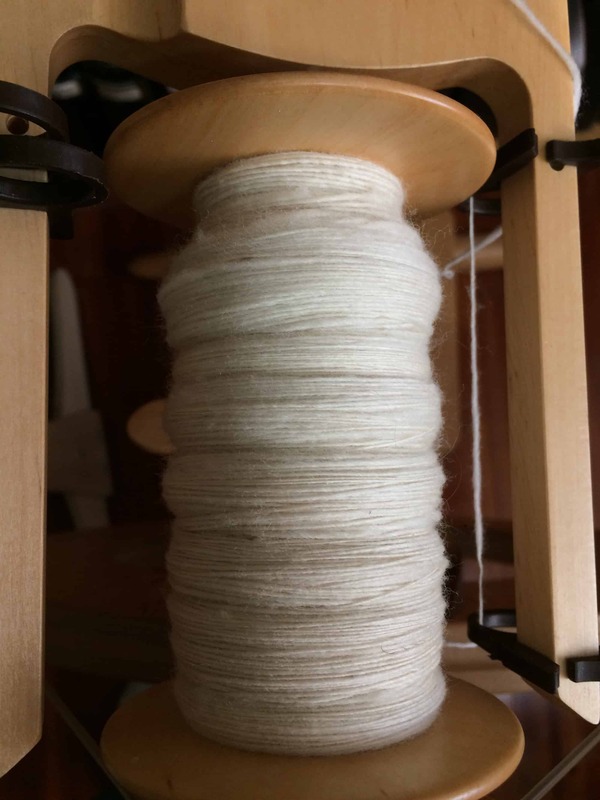 This fiber continues to spin up faster and thicker than the cormo. I can’t wait to see it finished! It’s been another busy week of crafting! Spending the entire weekend doing demos helped in that regard. 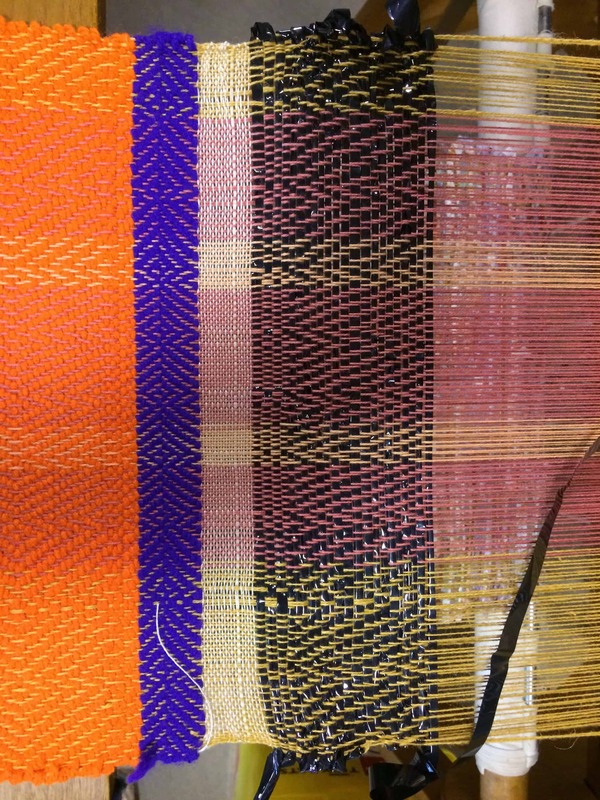 I worked slower than usual, since I was chatting with Festival attendees and regularly leaving my work aside to show an interested person how to weave on the floor loom, but I was there for so many hours that I got a lot done despite the frequent interruptions. I only got 1/2 of a repeat done this week. I will be bringing this project with me as travel knitting next week, and expect to get a great deal more finished. I spent most of Saturday spinning. 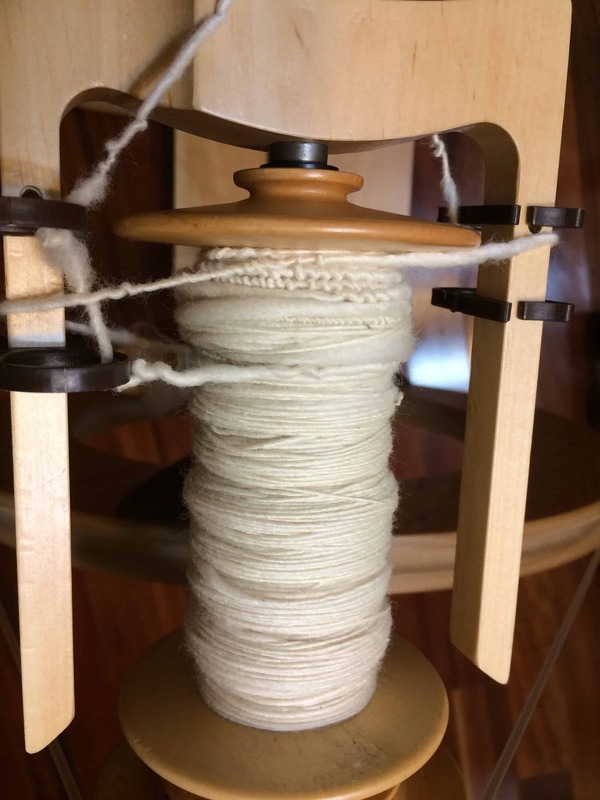 Three hours at my weekly spinning group followed by 5 hours spinning at the Festival of the Arts was enough time to spin at least half of the bobbin that is on my wheel (2.5 to 3 ounces). 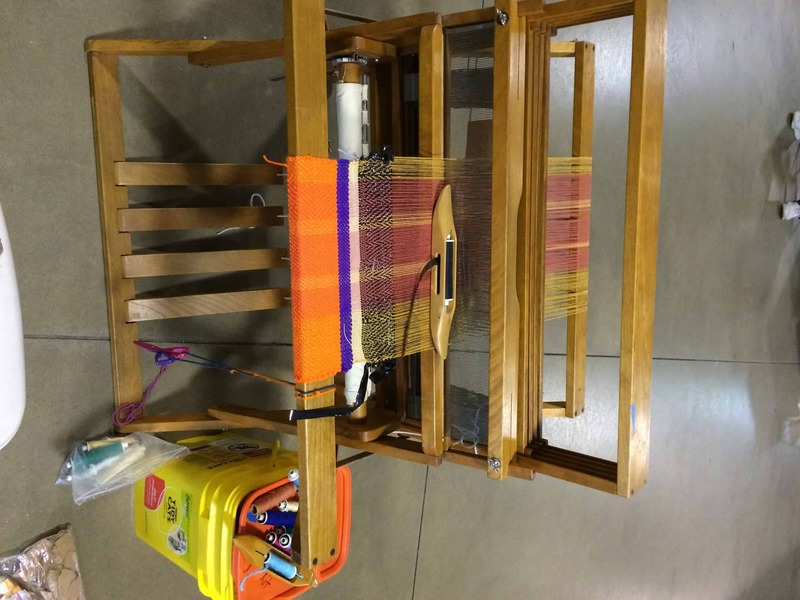 On Saturday night, I tied this scarf on to my rigid heddle loom. 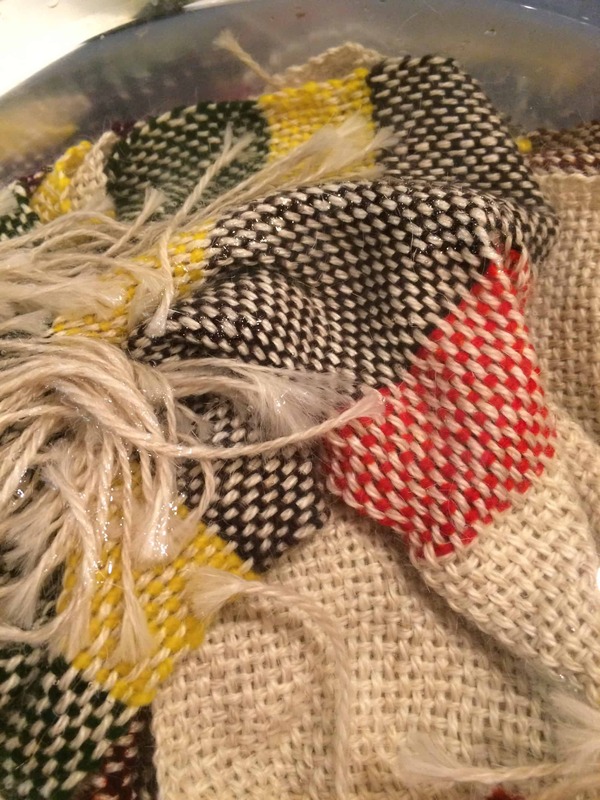 This evening I finished weaving it and it is currently soaking for wet finishing. No jokes or April Fools here. Just works in progress. 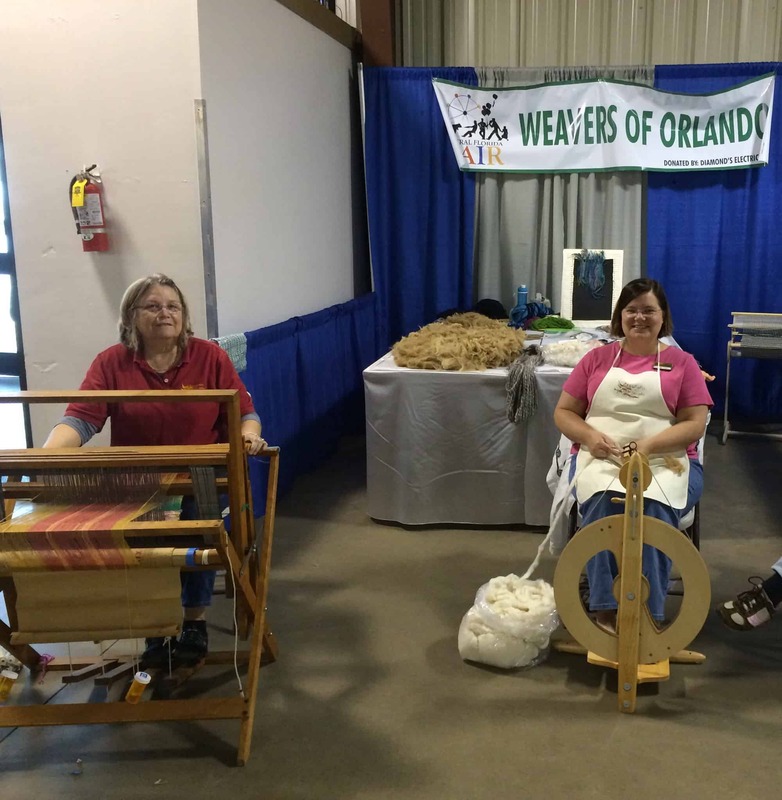 As I mentioned in my post about the St. Augustine Spin In, I spun a couple ounces of Cormo at the event. I’m still loving this fiber! When I got home from the Spin In, I collapsed on the couch and did some knitting. 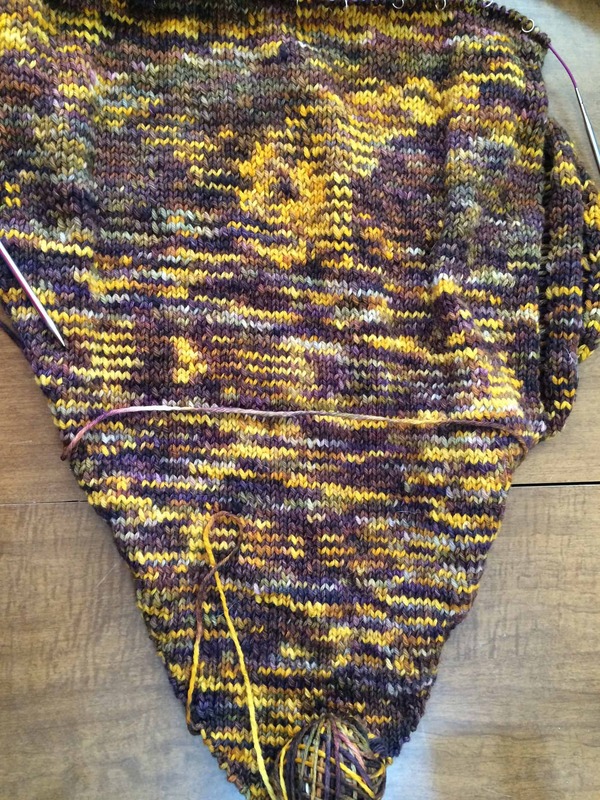 I’ve never knit a clapotis, so cast one on. I was thinking I might bring this to India as travel knitting, but at the rate I’m going, I’ll be done before I leave. I’m in the middle of the 4th repeat on the straight section. I’m almost at the end of my second ball of yarn and I only have 2 more. 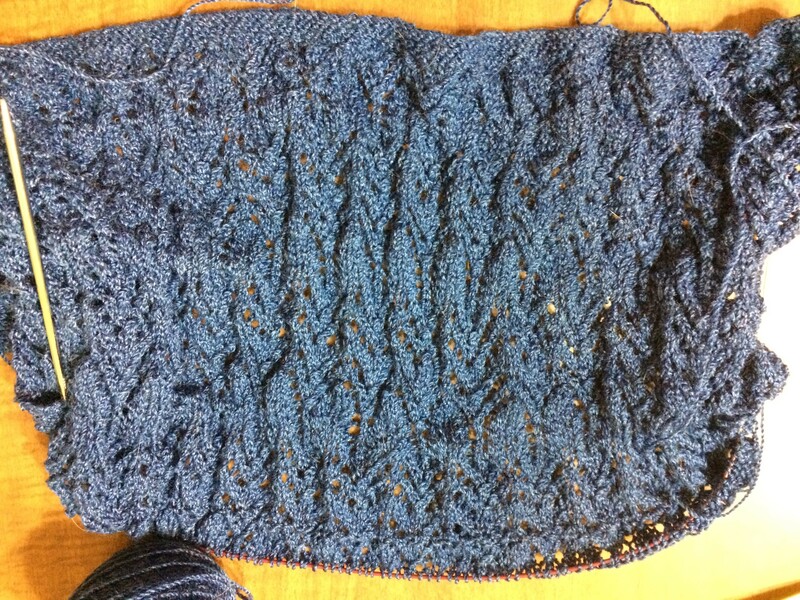 This means I’m close to halfway through the shawl. I won’t do all 12 repeats of the straight section, but I will get 8 to 9 repeats and that should be fine since I’m a short person! Today I went through the instructions again and made myself a checklist covering all the tasks that must be completed for Level 1. I am registered to attend the TKGA Conference in San Diego in late July, and I’m hoping that I can finish all of Level 1 before I go. I’d really like to finish by late May or early June so that I can submit and possibly get back my reviewed binder before the conference, but given how much traveling I’m doing over the 6 weeks, it seems unlikely that I’ll be able to do it. It is amazing how much work it is to prepare to travel to India! I got 5 shots of immunizations, a series of pills to take for a 6th, plus antimalarial and antidiarrhea prescriptions. 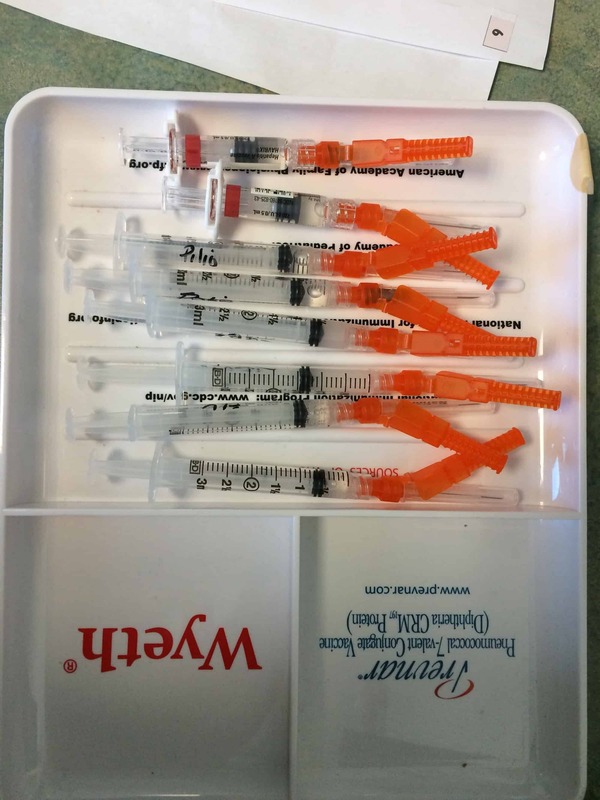 Two of these were for my husband’s; the rest of those needles were for me. He’d already had many of the necessary immunizations because of his previous travel. I applied for Global Entry, a program which makes the process of going through customs on the return trip much easier. That program required an interview, so I went and did that. We started applying for the travel visa and realized we needed additional information, so I went about procuring that. I called our credit card, cell phone carrier, and health insurance company to let them know we are traveling and find out if I needed to do anything with them before we left. There’s a lot more, but I can’t remember it all! Since I posted my original Breed Specific Fiber Inventory, I ordered additional fiber from A Little Barn (italicized in the list below) and from The Woolery (bolded in the list below). Here’s the updated list! Both orders have been shipped; I expect The Woolery order on Tuesday and the Little Barn order on Thursday or Friday. Also, because I think this project will take more than a year, I’m adding the tag ‘Breed Spin.’ I previously said the tag was BreedSpin2015, and I am going to keep that tag; I’m just adding the more generic one. 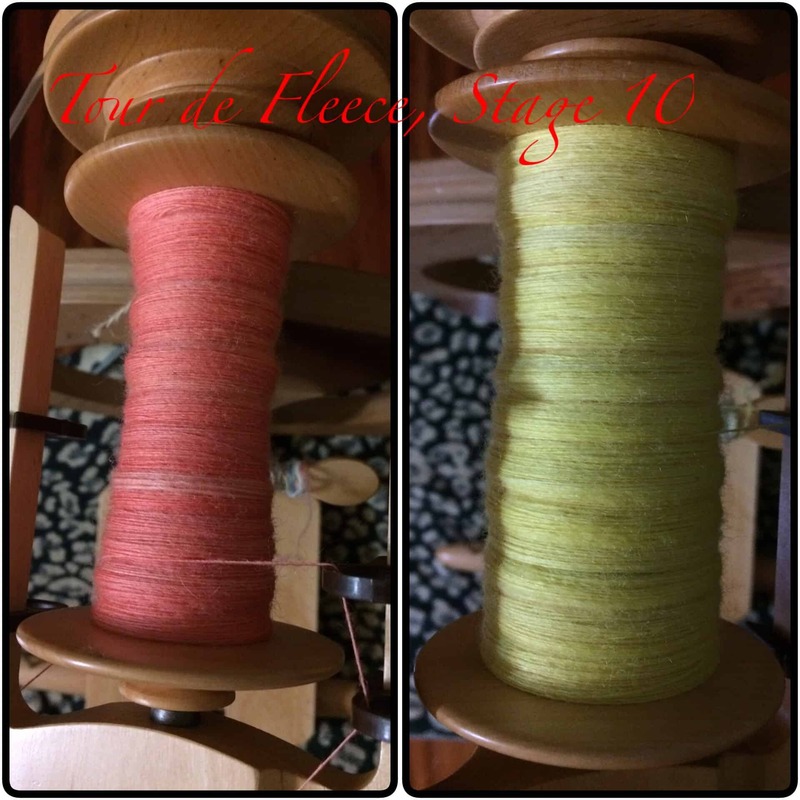 Yesterday, I started updating my fiber stash on Ravelry. I didn’t finish because I ran out of sunlight for taking pictures. I did, however, make a handwritten list of all the fibers I have so that I could take it with me to Distaff Day. Here’s the list! (Note: This is not a list of all the fiber I have; it is only the breed specific fibers and does not include blends).